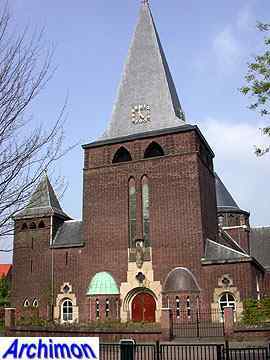 Hendrik Willem Valk was born in Elst on November the 18th 1886. 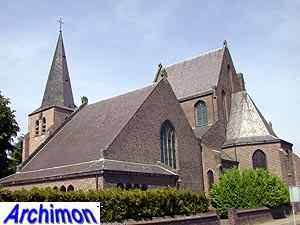 His father was a civil servant working for the Elst municipality, but after he resigned in 1890 the family moved to Blerick. 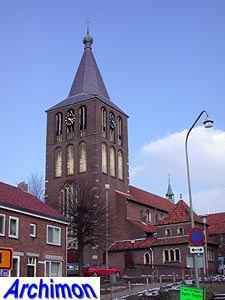 In 1890 they moved to Boxmeer, where Hendrik finished primary school. Although his father wanted him to become a civil servant as well, Hendrik decided to become an architect. He took a job at a carpentry firm and took a course in draughtmanship. In 1906 he completed his school and was drafted for military service, serving with the engineers. 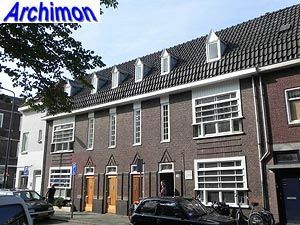 In 1907 he applied for a position as a draughtsman at the office of architect Frank Ludewig in Nijmegen. 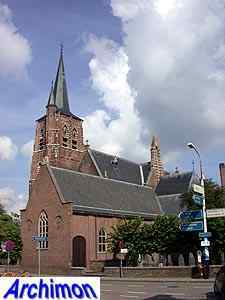 After that, for eights months in 1909 and 1910, he was employed at the office of W. te Riele in Deventer. Later in 1910, he was employed as a draughtsman by P.J.H. Cuypers, probably first in Roermond, later at the Amsterdam office. In Amsterdam he continued his education, now attendig a school for architecture. In 1911 he was promoted to the position of overseer; by this time he was working for Jos. Cuypers and Jan Stuyt mostly. 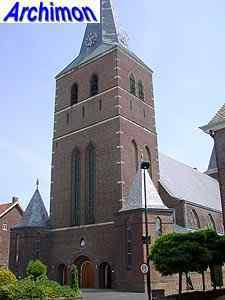 Especially Stuyt became a major influence for Valk, who shared Stuyts interest for early early-christian and Byzantine architecture. 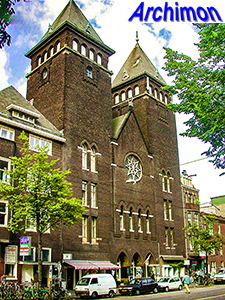 During his period in Amsterdam Valk witnessed the rise of the Amsterdam School of Expressionist architecture, which became an influence in his early work. His employment ended when he was mobilised at the eve of the First World War, and until 1916 he was in the army, part of the time in Scheveningen. In September 1916 Valk started his own firm in Blerick, where his mother lived. 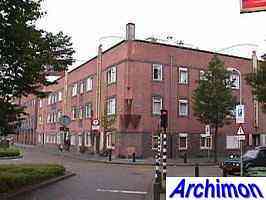 His first assignments were for housing projects in nearby Venlo. 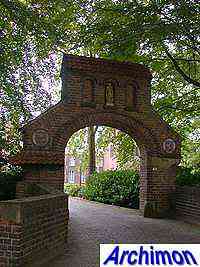 In 1918 he moved to 's-Hertogenbosch, where his first assignments were also for housing projects. He is also one of the ten architects of Betondorp in Amsterdam, an experimental housing project built with ten different systems of concrete. 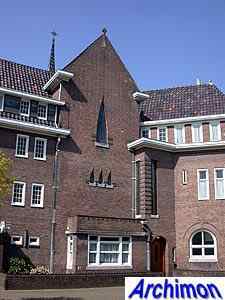 In this period Valk used a modern Functionalist style with influences of both the Amsterdam School and De Stijl. This early, modernist period of his career ended rather abruptly in the 1920's when Valk decided to focus on church architecture. Although he had designed several churches since 1915, none of these were ever built. 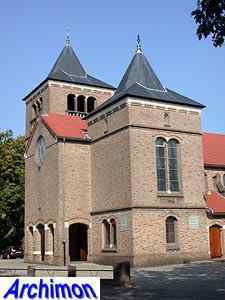 In 1923 however he was commissioned for the design of a church in Utrecht, soon followed by a second assignment for a church in Waalwijk, due to his former employer J. Stuyt who was too busy himself. 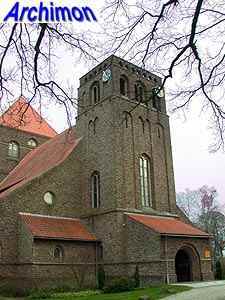 Valk's first two churches are dome churches in Expressionist style, built using skeletons of concrete and steel, with walls of bricks and with brick vaults. The influence of Expressionism on his work decreased until it completely disappeared in the early 1930's. In the course of the second of half of the 1920's and thereafter, Valk developed a Traditionalist style influenced by medieval architecture. Answering to the call of the Liturgic Movement for 'people's churches', Valk designed a number of churches with centralizing elements; a wide central aisle, narrow side-aisles, a wide transept and with the altar at the crossing, often illuminated from above by a crossing-tower and with a short apse behind it. In 1934 Valk wrote a book about these christocentric churches. From 1925 until 1937, Valk employed his brother Albert as an engineer, tasked with the technical analysis of the designs. Although Valk was a Traditionalist, he had no contacts with prof. M.J. Granpré Molière nor was he a member of the circle of architects around him, which later become known as the Delft School. Like A.J. Kropholler, Valk was convinced that good architecture should be rooted in craftmanship and the traditions of the rural parts of the country. Unlike Kropholler, who preferred wooden ceilings, Valk covered his churches with vaults whenever he could. 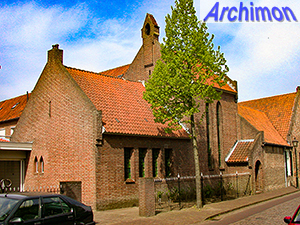 A special building in Valk's career is Fort Sint-Anthonie, the house and office he designed for himself and which was built on top of an old bastion in 1932. Valk occassionally conflicted with fellow architects. In 1929 he was expelled from the BNA, the country's leading organisation of architects. From 1937 until 1953 Valk promoted his designs for a new city hall in Amsterdam, for which he had lost the competition, even offering the design for free. Early in the Second World War, or perhaps earlier, he joined the fascist movement Zwart Front (Black Front, later renamed Nationaal Front) and became its leader for the 's-Hertogenbosch area in early 1941. Although this movement was disbanded by the Germans later that same year, Valk after the war was considered a collaborator. During the war he had published several articles and had accepted assignments from the nazi's, like that for a monumental bridge in Echt, Limburg, which however was never built. Until 1948 Valk was excluded from governmental assignments, with part of the catholic church following suit, while until 1950 he was not allowed to enter competitions. After 1950 he was once again very active. In this period he occassionally was assisted by his sons G.H.F. and H.W. Jr.. The role of the two sons increased after Valk's wife, their mother, died in 1958. After H.W. Valk jr.. left the office in 1963, it was lead by G.H.F. 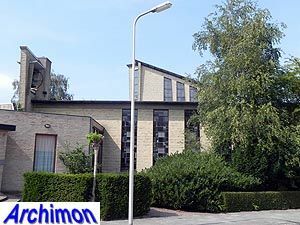 Valk and moved to Rosmalen in 1973. H.W. 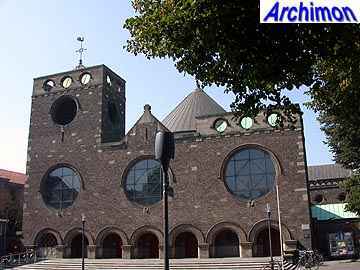 Valk died in 's-Hertogenbosch on July the 29th 1973. The following is a list of both his religious and profane work, and is still incomplete. 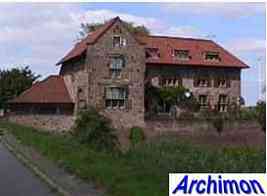 Pictures positioned on the right are restorations etc..
Four houses for noncommissioned officers. Two houses under one roof, built for the owners of a brick factory. 19 houses in sober Expressionist style. Three-storey apartment-building in moderate Expressionistic style, and the first such building in this city. Although built of concrete, the front was covered with bricks.The white plastic covers on the roof are not original. Houses in a Functionalist style, built of concrete and with flat roofs. 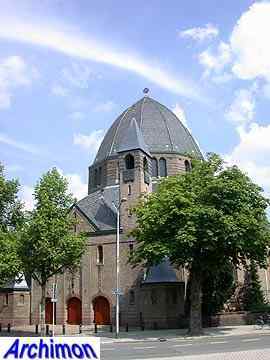 Valk's first church, a hexagonal building in Expressionist style with dome and a small tower at the front. Brick building around a skeleton of concrete. Original design included a tall tower. Valk probably had to thank Jan Stuyt for this job, who was originally commissioned. This was Valk's largest assignment ever and the largest dome-church in the entire country. 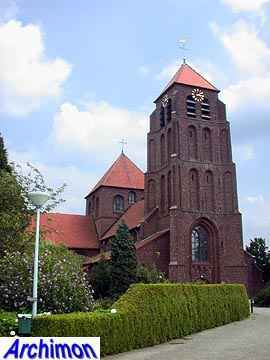 The church, built of brick around a skeleton of steel, has 19 parabola-shaped copperplated domes and a minaret-like tower. The largest dome is on the central church-space; the other domes are on chapels which are arranged radially around the central space. New nave and front in Expressionistic style for an older church. The extension was a gift from the farmers organisation NCB, the founder of which, Father G. van der Elsen, was honoured with a sculpture at the front. Robust three-aisled cruciform pseudo-basilica in Traditionalist style with references to late-Gothic. Three-aisled cruciform basilican church in moderate Expressionistic style, with some references to Gothic. The tower was finished 1951-1953 by G.H.F. Valk, H.W. 's son. 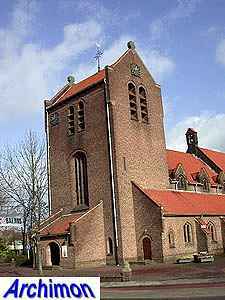 Church with robust front with two towers. Currently used as a mosque. 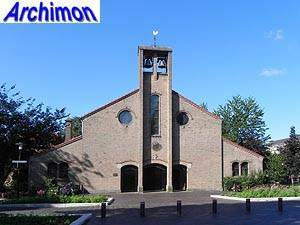 Robust three-aisled church in Expressionist style. Convent built in Expressionist style, with school. Three-aisled towerless basilica in moderate Expressionist style. 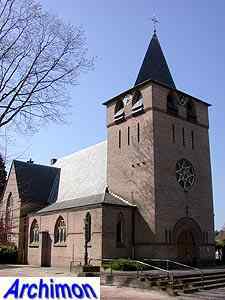 Wide nave with narrow side-aisles and three large dormer windows on either side serving as a clerestorey. Demolished in 1996. Complex in Expressionist style, with chapel and school. Christocentric cruciform basilica in a Traditionalist style inspired by Gothic. Frontal tower flanked by polygonal chapels. 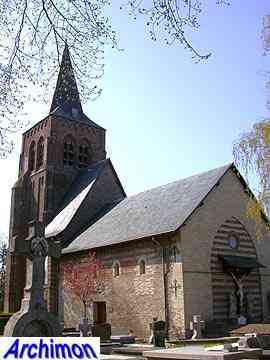 The choir is a crossing-tower with a lower polygonal apse. A group of houses decorated with elements in Expressionistic style. This medieval church was enlarged by the addition of long chapels on both sides of the choir. Town hall in Traditionalist style. Largely destroyed by an attack by criminals in 2012. Three-aisled towerless basilica in moderate Expressionist style. Wide nave with narrow side-aisles and three large dormer windows on either side serving as a clerestorey. 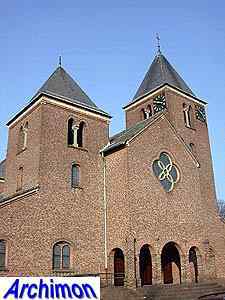 Very similar to the eponymous church in 's-Hertogenbosch, built a year earlier. Demolished in 1981. 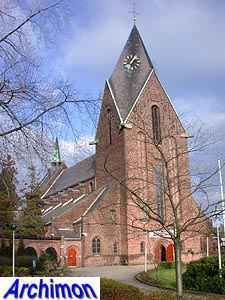 Complex in moderate Expressionist style, with chapel. Recently rebuilt into apartments. 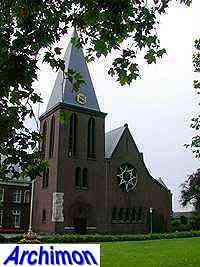 Church designed in cooperation with C.W. van den Beld. Influences of Amsterdam School Expressionist architecture. Dome on the crossing, wide transept. 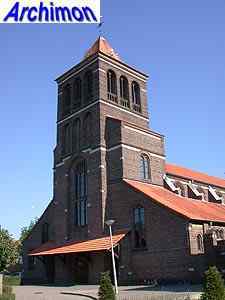 Short but wide tower at the front, as well as a smaller tower. New nave and transept added to an otherwise medieval church. Compact cruciform church in a combination of Expressionism and more traditional styles. Transept is lower than the nave, the tower has stepped gables. 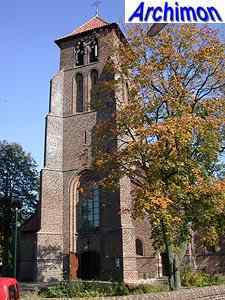 Enlargement of a medieval church. Side-aisles lengthened to run along the tower, lengthening of chapels and replacement of the choir by a new one with lateral-chapels. These measures resulted in a centralizing ground-plan, a christocentric church. 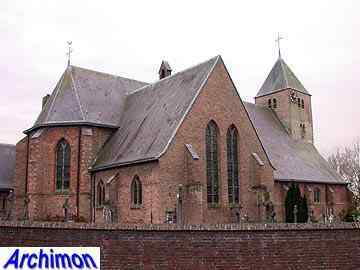 Cruciform church with a transept lower than the nave. Valk's design replaced a medieval church of which only the tower was spared. Three-aisled basilican christocentric church in Traditionalist style. 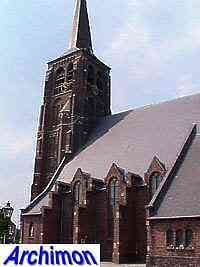 The tower has four pointed gables, the spire has four rhomb-shaped sides. 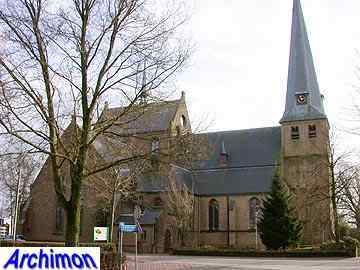 Choir largely similar to that of the church in Panningen. Town hall in Traditionalist style, with stepped gables. 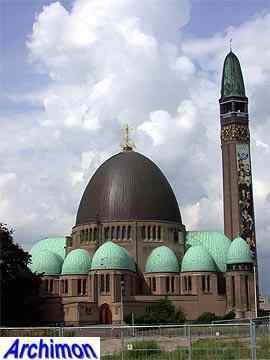 Christocentric cruciform basilica in Traditionalist style with influences from Romanesque and Gothic architecture. 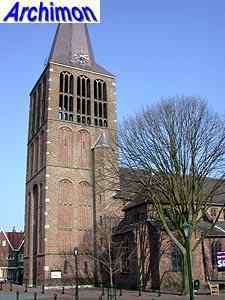 Tower similar to the one in St. Michielsgestel (1930). Several buildings, including a chapel, were added to the original convent, an old house. Valk assists architect J. Bongaerts for this project, a house in Traditionalist style. Church in Traditionalist style. Damaged during WWII when the tower was blown up and after the war restored by H. Valk jr. The tower was rebuilt in 1958 by Joh. 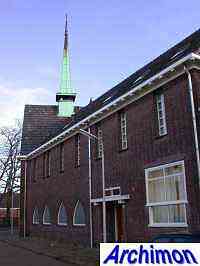 H. Sluijmer, but following the original design. New christocentric transept, crossing and choir added to an otherwise medieval church. Christocentric cruciform basilica in a style inspired by early Gothic. Tower in 'Gothic' style. Large square crossing tower. Cruciform centralizing church in neo-Byzantine style with asymmetric facade and wide tower. Designed in cooperation with Joh. H. Sluijmer. Valk's own house was built, with special permission, on top of an old fortress at 's-Hertogenbosch's entrance when coming from Vught. It's decorated with many elements taken from older styles. Cruciform basilican church with a tower of five segments, three-aisled nave and transept, square crossing-tower with saddle-roof above the choir. 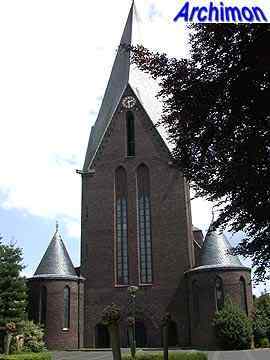 The design of this christocentric church shows influences of Gothic. 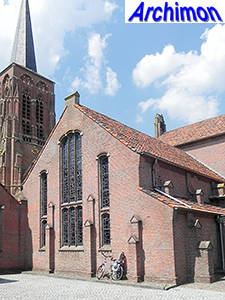 Due to the materials that were used, notably the hand-shaped bricks, the church at first sight looks much older than it is. Originally the crossing-tower was planned to be taller than the tower. Christocentric cruciform basilican church, with very wide transept and square crossing-tower. Frontal tower inspired by Gothic. 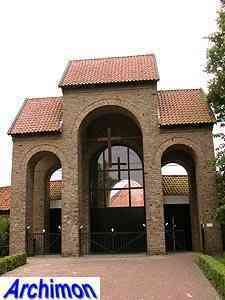 Chapel in neo-Romanesque style for a so-called procession-parc. House for writer Anton Coolen, similar in style to Valk's own house. Coolen was not completely satisfied; the house was too large, and thus too expensive. Also, Valk had done several experiments with new materials that continued to cause problems for some time. 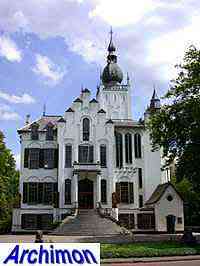 Rebuilt of a neo-Gothic house from 1901 into a town hall. The tower was given a new onion-shaped spire, while statues were placed at various corners of the building. During the first stages of the restoration of this old church the Romanesque origins of the nave are discovered. The nave is reconstructed to its original state while a Gothic trave and tower are restored the way they were, resulting in a strange contrast. 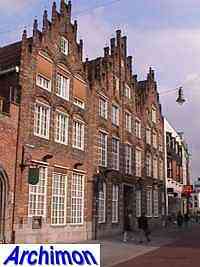 Two medieval houses received a new facade in late-Gothic style, and became the head-office of the Van Landschot Bank. Three-aisled pseudo-basilican cruciform church in Traditionalist style mixed with Gothic influences. Big basilica in Traditionalist style. Three-aisled basilica in Traditionalist style, designed in cooperation with G.H.F. Valk, replacing a destroyed church by W. te Riele. 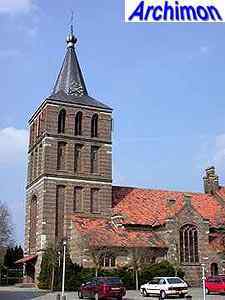 Large cruciform church with tower and square crossing-tower. Demolished 1982. Cruciform church designed in a combination of styles in cooperation with G.H.F. Valk. 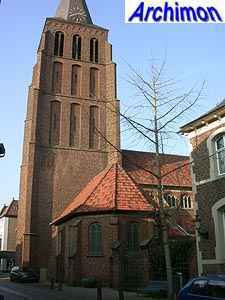 Tower in semi-Gothic style. Transept lower than the nave. Nave is very similar to those of other churches by Valk of this period. Three-aisled basilican cruciform church, incorporating a medieval tower. Designed in cooperation with G.H.F. Valk. Church designed in a Traditionalist style. 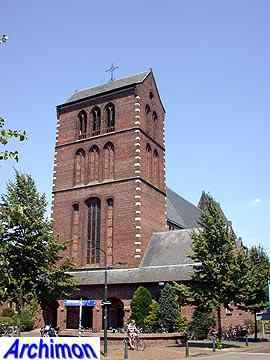 Front with two different-sized towers in Romanesque style. Probably designed in cooperation with G.H.F. Valk. 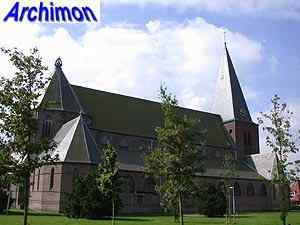 Church in a Traditionalist style, designed in cooperation with H.W. Valk jr., G.H.F. Valk and F.H. Stoks. 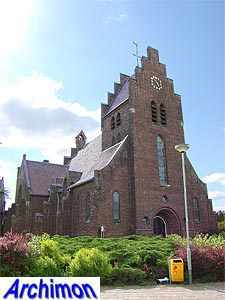 Front with two different-sized towers in Romanesque style, similar to the church in Apeldoorn. Small windows. Square crossing-tower. Church in Traditionalist style. Square crossing-tower. Probably designed in cooperation with G.H.F. Valk. Valk's last church. 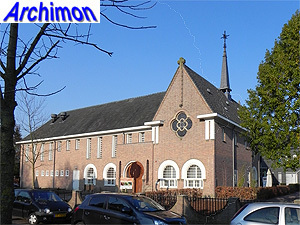 Hexagonal church in a moderm Traditionalist style. Probably mainly designed by G.H.F. Valk.